Self-care is important not only for my well being but also for the well-being of my family. As a busy mom, I don’t have a lot of time to spare which is okay, for me it’s the short, simple self-care rituals that I try to incorporate into my day that really help me out. Listen to your favourite music – A playlist with some of my favourite songs or the music app for my favourite radio station are my 2 chosen ways to listen to music. It’s amazing what this can do for your mood and it’s even resulted in some impromptu dance parties. Seek out adult interaction – I am around kids all day, and there are a few nights a week that Kris isn’t home until late. Finding those couple of minutes to make a call, send a text or a message on Facebook on some days is my lifeline and helps to keep me sane. Find your ‘pick me up’ – Enjoying a hot coffee is one thing that I enjoy and it makes me feel relaxed. Sometimes my coffee is warmed up a few times in the microwave but I still get to it at some point. Schedule some ‘me time’ every day – Hands down, taking a hot bath while Kris holds down the fort is my ultimate go to. 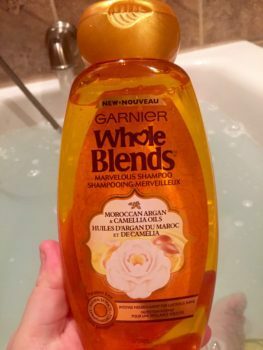 When I do, I’m taking that time and using the new Garnier Whole Blends Moroccan Argan and Camellia Oils shampoo and conditioner. The subtle and pleasant scent of this new blend reminds me of summer all day long and leaves my hair feeling nourished and smooth which at times can be hard to achieve in winter weather. Whether you’re looking to boost your colour, hydrate your hair, or moisturize and restore silky shine there is a Garnier Whole Blends option for everyone in the family. Learn more about Whole Blends here. Also available in NEW Legendary Olive blend, the Garnier Whole Blends line is paraben free, contains natural extracts, and is made with gentle sulfites. All of which, as a parent makes me confident and comfortable with my kids using the Whole Blends hair care line. Along with shampoo and conditioner, there are also sprays and oils that accompany each blend. For the Moroccan Argan + Camellia Oils blend, the Marvelous Oil can be used before shampooing, brushing, and blow-drying, all to help nourish, soften, and protect hair. 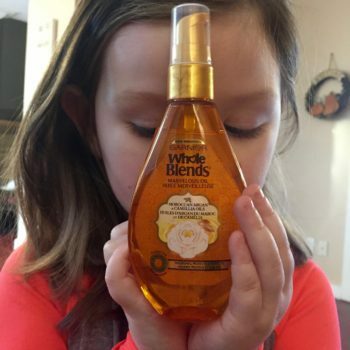 With a 4 year old that normally would get tangled hair in a matter of minutes, using the Marvelous Oil has helped to combat that problem! Want to make the new Moroccan Argan + Camellia Oils blends part of your self-care ritual? 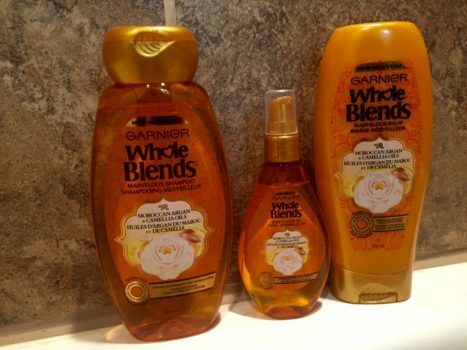 Sign up for the coupon to save on your next Garnier Whole Blends product purchase. Take some ‘me time’ and join the conversation about everything #NewWholeBlends at the Twitter party on Thursday, February 16th at 7 pm EST (5pm MST for anyone in Edmonton). Sometimes it’s the little things that count the most. What are some of the simple ways that you incorporate self-care into your day?